Watch this video to see why regardless of age, or ability, you can quickly and easily become conversational in Russian. The complete Russian Accelerator online course costs $388 (paid in four monthly installments of $97. However, for $1 you can access Russian Accelerator for 21 days to be certain that you are getting results before making further payments. The $1 trial is a win-win situation, because it keeps those who are less serious from taking up our coaching and support resources, and gives you a chance to try it before fully committing to the program. 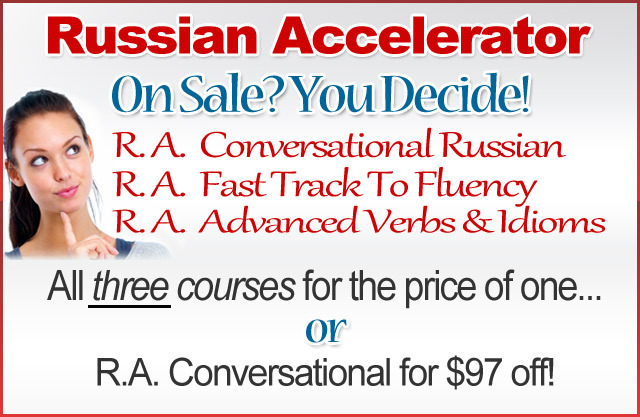 Twenty-one (21) days access to the first three units of the Russian Accelerator Conversational Russian online course. With the current Bundle offer, you also get R.A. Advanced Verbs & Idioms, and R.A. Fast Track To Fluency Courses ($200 value) at no extra cost, if you decide to continue after the trial period. With the current "On Sale? You Decide!" promotion, if you would instead like a discount of $97 off the main Russian Accelerator Online course, you can choose that option below. Which is the better deal depends on your situation. The main course is massive and comprehensive and will have you speaking intermediate conversational Russian by the time you are done. The other courses were developed for those who finished the main course, but wanted to branch off and continue their studies. Regardless of which you choose, you are also getting the following BONUSES, which are yours to keep regardless of whether you continue or not. They are our gift to you just for trying it out. Twenty-one (21) days access to Russian Accelerator's Success Coaching. Build your confidence by getting invaluable feedback from our staff of native speaking Success Coaches. Send questions, send audio files, and get personalized responses to guide your progress! After the 21 day trial, if you do not cancel you will be billed four (4) monthly payments of $97, for a total of $388 if you choose the bundle option. Billing ends automatically after the 4th payment. After the 21 day trial, if you do not cancel you will be billed three (3) monthly payments of $97, for a total of $291 if you choose the Main Course $97 Off option. Billing ends automatically after the 3rd payment. We also send you a reminder email well before the trial period ends so that you can easily let us know if you would like to cancel before any charges take place. * Reply to the reminder email when it comes. * Access to "Russian Alphabet Mastery: Master Russian Reading"
* All six volumes of the downloadable ON THE GO series. * Language Q and A, additional Native Speaker videos, and much more! If you are not satisfied with your language ability after completing the program, you can receive a full refund up to one year from the date you joined. No questions, no hassles. If you are not speaking Russian at a level that you judge to be satisfactory, and would like your money back, simply ask. This is an online course, so there is nothing to return. No fine print. Please note* The $1 trial "On Sale? You Decide!" promotion is a temporary offer, and may be removed at any time. Thank you, and we look forward to working with you on the inside.